Sweet victory: Gujarat CM Narendra Modi at the BJP headquarters in Ahmedabad after the party registered a win in state assembly election. New Delhi/Ahmedabad: The Bharatiya Janata Party’s (BJP) comfortable electoral win in Gujarat, cheered by local business leaders, will shift the focus back to the Centre, where the Congress party, part of the ruling coalition, is engaged in continued brinksmanship with its ally, the Left parties. Another key electoral battle between the Congress and the BJP—in Karnataka—is likely to come as early as March. A weakened UPA, or the United Progressive Alliance coalition, will now come under pressure to enhance giveaways and soften the reformist edge to the Union Budget due to be presented on 28 February. It is also likely to find it difficult to resist growing Left pressure against implementing the civlian nuclear deal signed with the US, though the Left parties, too, are unlikely to want early elections, given their own recent political troubles. 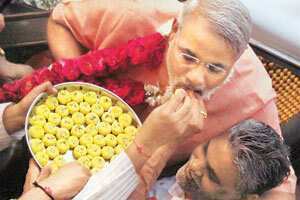 Gujarat chief minister Narendra Modi led the BJP to a resounding win with 117 out of 182 seats going his way. The Congress improved on its past performance but ended up with just 62 seats. Throughout the long election campaign, Modi pointed to the successful development agenda pursued by his government. And, towards the end of the campaign, he joined senior BJP leaders in going after the UPA’s poor record on internal security in the country. This line of campaigning is likely to be a key plank of the BJP’s electoral agenda for the next national election, which many believe could come some time in 2008. The Congress, led by its president Sonia Gandhi, had attacked the BJP, and Modi in particular, for failing to protect minorities in the state. “Prakash Karat (Communist Party of India Marxist, or CPM, leader) had said that his party is not attacking Congress over the nuclear deal because it does not want the BJP to gain mileage from it in the Gujarat polls. Well, now he has his answer," said BJP national spokesperson Ravi Shankar Prasad. “The government will not be able to get the nuclear deal through," maintained Communist Party of India leader D. Raja. “After Gujarat, the Congress must now introspect more deeply about a range of issues including secularism, its economic policies and the nuclear deal as well." The CPM, which has been most vocal in opposition to the nuclear deal and to the UPA’s economic policies, issued a statement that warned the Congress against relying on “electoral efforts alone" to defeat communal forces. Modi’s victory, said Paru Jaykrushna, president of the Gujarat Chamber of Commerce and Industry, means that “all projects and policies evolved over the last five years" would be boosted. Industry in Gujarat grew at 15-20% during Modi’s tenure. “Corporate Gujarat is very happy and we feel that the continuity means that now the stage is all set for inclusive and overall growth of the state," Jaykrushna said. Modi has been pushing Gujarat into the SEZ, or special economic zone, route and to become the petroleum capital of the country. There are over 50 SEZs proposed in the state and of the total petroleum products used in the country, 65% passes through Gujarat. Work on the only two liquefied natural gas terminals in the country, at Dahej and Hazira, has begun, even as the state has extended the natural gas transportation pipeline to over 1,500km. The state gross domestic product has, in the last four years, grown ahead of projections. “Unpublished figures for the year 2007-08, that would be announced in next state budget, is expected to be at the high of 11.26%," said Sunil Parekh, adviser, Crisil Ltd.